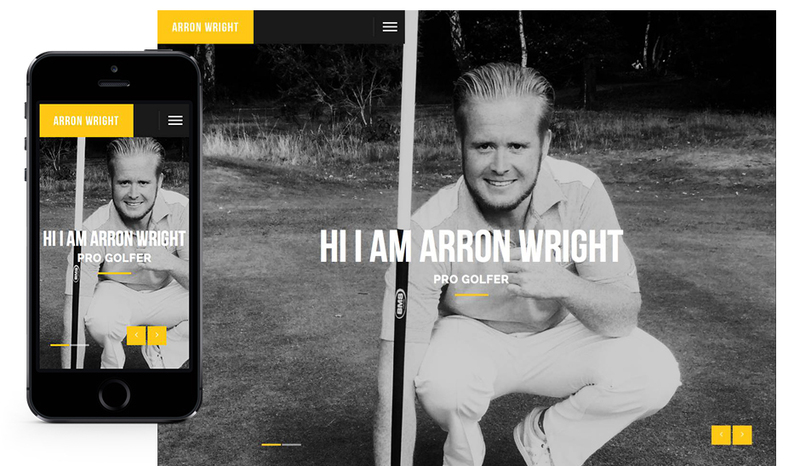 Brave Thinking has just launched the website for professional golfer Arron Wright. As lovers of the game we were thrilled to know we would be working with Arron on his website and all digital marketing. It is apparent that in addition to hard graft and dedication, golfers get noticed off the golf course with their branding and products. Fans can keep up to date by checking their favourite golfer's website, Facebook and Twitter feeds. It's a way of getting noticed in a highly competitive world. But let's not forget you still need to play brilliantly. Take Jordan, Rory and Justin. They all have logos, branding, websites, massive social media presence, their own product ranges and an awesome game. With this in mind, Arron made it clear his focus needs to be on his game and the season ahead. Happy to put his trust in Brave Thinking, we take care of branding and digital marketing and Arron takes care of getting the ball in the hole. The vision for the website was to include cool styling, powerful images and a great user experience. As Arron is currently on the PGA Euro Pro Tour and has made the last round of qualifying for The Open being held at Royal Troon, we ideally we wanted to launch in time for Arron's first win as a professional. We created, edited images, wrote copy and launched the website in a week. Make sure your name, brand and digital presence is as powerful as your game. Get the right attention on and off the course with the help of Brave Thinking. Call now on 01403 753141.